Humberto Quintero provided the only extra-base hit for Pawtucket, as he went 1 for 3 with a double, while Deven Marrero, Marco Hernandez, and Carlos Rivero all added singles. Behind a dazzling start from Aaron Wilkerson, the Sea Dogs squeaked by with a one-run victory. Wilkerson went the first seven innings, allowing one run on four hits while striking out four. After allowing nine runs in his first 10 2/3 innings with Portland, Wilkerson got back on track last night and earned his first victory. Kyle Kaminska earned the save with two scoreless innings to close it out. A two-run home run from Tim Roberson in the top of the seventh was the difference in this game, scoring Sam Travis who had doubled earlier in the inning. Manuel Margot and Carlos Asuaje each had two hits, with Margot adding a double. It was only the fourth multi-hit game for Margot over his last 21 games, a span over which he has hit .218. A quality start from Daniel McGrath was not enough, as Salem's offense struggled with runners on base. McGrath went the first six innings, giving up three runs on five hits, while striking out three. It was the first time McGrath went at least six innings since May 12. German Taveras gave up only a walk in his two innings of shutout relief. Wendell Rijo and Cole Sturgeon each had a double and an RBI, and Deiner Lopez added two singles. The team went 1 for 8 with runners in scoring position, and left eight men on base, including five over the last four innings. Aside from a great game from Yoan Moncada, not much went right for the Drive on Tuesday. Luis Ramos was roughed up for five runs in his 5 1/3 innings, as his ERA remained over 8.00, but Michael Gunn held the Grasshoppers scoreless over the final 2 2/3 innings. 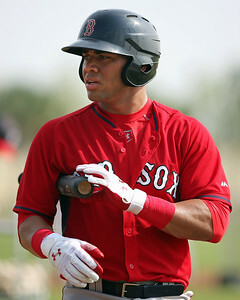 Moncada was the lone bright spot, going 3 for 4 with a double, home run, and two stolen bases. The home run was his seventh of the year, and his fifth against a left-handed pitcher. His splits are much better from the right side of the plate this year, which jives with SoxProspects.com Director of Scouting Ian Cundall's assessment of the talented switch-hitter. In the New York-Penn League All-Star Game, the North All-Stars defeated the South All-Stars 4-2. While Lowell's coaching staff led the North team, the players representing Lowell did not do much. Josh Ockimey, Victor Acosta, Chad De La Guerra, and Luis Alexander Basabe combined to go 0 for 6, and Acosta also committed two errors. A bunt single was all that kept Anderson Espinoza from a perfect day, as he was dominant again against the Rays. Espinoza struck out seven and allowed only the one hit over four innings, lowering his ERA to 0.75. The bunt single led off the fourth inning, but was quickly erased by a double play, and then Espinoza struck out the last batter to put an exclamation point on an impressive performance. Yankory Pimentel was just as good, striking out five over three innings, and Carlos Garcia added a scoreless inning. An injured leg was the only thing that could slow down Tyler Hill, as he went 3 for 3 with a double and three RBI. Chris Madera pinch ran for Hill and picked up right where he left off, doubling in his only plate appearance. Darwin Pena knocked in two runs with a single in the eighth that put the game out of reach. The Red Sox are six games ahead of the GCL Orioles with 10 games to play. A late comeback and a tremedous pitching performance led the Red Sox past the Dodgers. Junior Espinoza struck out eight of the 21 batters he faced over six innings, allowing only one run on two hits. He left with the score tied 1-1, and Juan Florentino got the victory after pitching a scoreless bottom of the seventh. Shair Lacrus earned the save, allowing one run over the final two innings. Marino Campana led the way going 2 for 4 with two doubles and a walk, and Luis Benoit and Luis Yovera also added two hits. A four-run first inning proved to be the difference as the second Red Sox squad stayed alive in the playoff chase. Victor Garcia allowed two runs, one earned, over four innings, and Ryan Oduber picked up the win with three innings of one-run ball. Ramses Rosario earned his first save of the season with two scoreless innings, striking out one. The Red Sox did all of their damage with two outs in the first inning, scoring for times on four walks and three hits. Juan Barriento had three of the team's six hits, and Imeldo Diaz went 1 for 2 with a walk. Pitcher of the Night: Anderson Espinoza's dominance of the Gulf Coast League has been impressive, but his work against the GCL Rays has been otherworldly. In four starts, Espinoza has not allowed an earned run to the Rays over 16 innings, surrendering only nine hits and two walks, striking out 14. While a promotion to Lowell this season is not out of the question, the decision to start him in Lowell or Greenville next year will be a very interesting one. He is certainly ready for Greenville from a talent perspective, but the Red Sox may want to limit his innings with an assignment in short-season ball next year. Including the upcoming playoffs, Espinoza will likely end the season with around 60 innings pitched, and if the Red Sox believe he can handle 100 innings next season, he may begin the season as an 18-year-old in the South Atlantic League. Batter of the Night: Usually we only pick one player as the Player of the Night, but both Espinoza and Yoan Moncada deserved recognition for their performances. Moncada now has hit .340/.432/.566 since the All-Star Break, and the 20-year-old appears to be ready for the Carolina League. He has also stolen 34 bases over the last 45 games, while only being caught three times. While Ben Cherington is on his way out in Boston, his parting gifts may be Espinoza, Moncada, and Andrew Benintendi, who were all acquired over the last 13 months.